Home Adult Use Can You Get Marijuana in Washington D.C.? In Washington, D.C., recreational marijuana is legal but not necessarily easy to obtain because the law does not allow for sales. With medical marijuana, the process is similar to that of other areas of the country. Federal law also applies in many areas of the city, so for visitors it can be important to know how to access cannabis legally. With medical marijuana, which the city’s voters legalized in 1998, the good news for travelers is that there is reciprocity with the following states: Colorado, Connecticut, Delaware, Florida, Hawaii, Illinois, Maine, Maryland, Massachusetts, Michigan, Montana, New Hampshire, New Jersey, Oregon, Rhode Island, and Washington. Patients with recommendations from those states may be able to access cannabis at one of the city’s five medical dispensaries. Patients from Alaska, Arkansas, California, Georgia, Minnesota, North Dakota, New Mexico, Nevada, New York, Ohio, Pennsylvania, Puerto Rico, and Vermont, however, do not have reciprocity. For residents, the first step is to find a licensed physician (or dentist or nurse practitioner) to make a recommendation. To make a recommendation, a physician must be on a list approved by the Department of Health. Some centers advertise the service of making recommendations. Doctors are able to recommend medical marijuana for any condition for which a patient may obtain a medical benefit that outweighs the risks. A recommendation costs $100, but for patients who earn less than 200 percent of the federal poverty level, reduced fees and prices are available. Photo identification is also required. Until recently, an assignment to one of the dispensaries came with a recommendation; one had to submit a form and a fee to switch. (Many of the laws affecting the medical program were enacted to prevent abuse in the form of recreational sales, but over the years, some of these laws have been relaxed.) Once a recommendation is obtained, patients and caregivers may possess up to two ounces of dried cannabis or an equivalent in other forms such as edibles or drops. There is a 30-day waiting period between purchases of this maximum amount. Purchasing for adult use is trickier, at least on paper, because while it is legal for adults to cultivate, possess, and use marijuana in D.C., it is illegal to sell. It is not illegal to give marijuana away, however, which has led some entrepreneurs to sell ordinary items at inflated prices and “give” marijuana along with the purchase. While the police have made it clear that this practice is illegal, including by making arrests, it continues to flourish. One common way that these sales are conducted are by “pop up” parties, which are advertised on social media and event sites. But visitors may be able to obtain deliveries under a similar process. When the police get involved, it is often because neighbors have called to complain about traffic and the smell of the smoke. In addition to pop up parties, another way that people in Washington are obtaining cannabis is by growing it themselves. An adult may grow up to three mature and three immature plants. This has led to a surge in at-home growing. Workshops and clone giveaways are well attended, and reports are that many who started growing poorly to save money or out of curiosity have become proficient at home growing, sometimes also growing food as well. One final warning for visitors: much of the city is under federal jurisdiction, for example the National Mall and the federal parks. While the city’s police have decided to reduce enforcement of laws against public consumption, in federal areas, marijuana remains illegal, and those arrested for possession or use face federal penalties. What do you think? 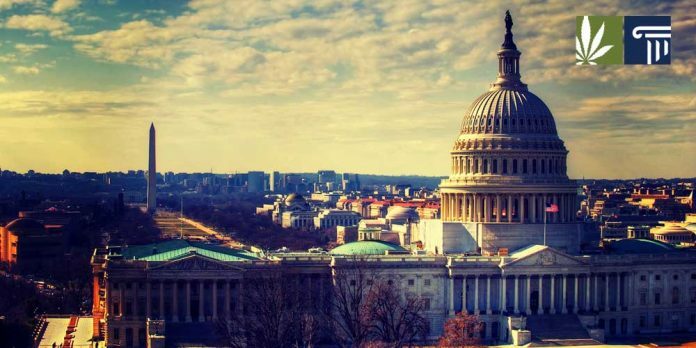 Will the 2019 Congress take action toward relaxation of federal law? Leave a comment below.